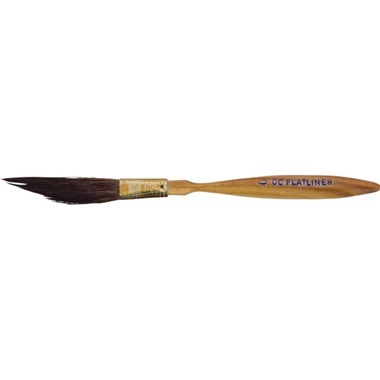 Developed in the 1890s, Mack Pinstriping Brushes have long been the favorite among pinstripers and painters. Just like in the beginning, Mack Brushes are still handcrafted in the USA using only the highest-quality materials. All Mack Brushes feature bristles that are wound with thread, glued, and treated so they won't pull out. Brushes are designed for user comfort -- they feel great in your hand whether running long stripes or tight curves. You will love your Mack Brush! Mack DC Flatliner Brush - The DC Flatliner is a very "fast" brush designed for long lines. Brush is made with squirrel hair from China, which is softer than the traditional Siberian Squirrel Hair. Overall length is approximately 4-3/4". Made in USA.